Print of the author, playwright and actress, Anna Cora Mowatt (1819-1870), ca.1840s. 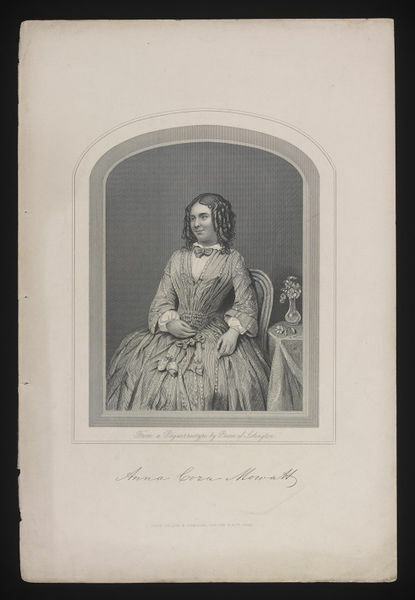 Print of the author, playwright and actress, Anna Cora Mowatt (1819-1870). 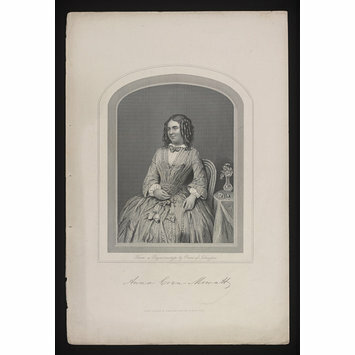 The print features a three-quarter length image of Mowatt who is shown in a seated position and with her gaze directed away from the viewer. She is wearing a a dress with a pleated bodice, full flaring sleeves and a wide skirt. A small table, on which there is a vase full of flowers, is positioned to her left.